Who? KBF Partners are clubs, circuits, and events that align with Kayak Bass Fishing, LLC (“KBF”) with benefits and commitments laid out in an annual KBF Partner Agreement. This page is for KBF Partners and businesses that are exploring hosting a KBF TRAIL Series Tournament. What? This is a guideline with job aids (e.g., check-lists, data sheets), instructions, resources, policies and procedures that a KBF Partner uses in planning and conducting a KBF TRAIL Series Tournament, a KBF OPEN, or other KBF-affiliated competitive event. When? After an organization commits to be a KBF Partner, it can explore opportunities for mutually-beneficial events that run from January through October each year. Where? KBF-sanctioned events are hosted by KBF Partners on lakes and rivers in their own backyards. Ideally, it’s in an area where a local chamber of commerce, tourism bureau, or economic development council or agency can support and help defray the expenses of organizing, promoting, and hosting an event that draws competitors from a multi-state region. How? Below are resources, advice, and guidelines that explain the steps involved in organizing and running a KBF-sanctioned tournament: what you should expect from KBF, and what you will be expected to contribute in order to run a successful event. Event organizers and directors are asked to use an online KBF Event Planning Data Form to provide and update information KBF needs to create and communicate about your event. Why? 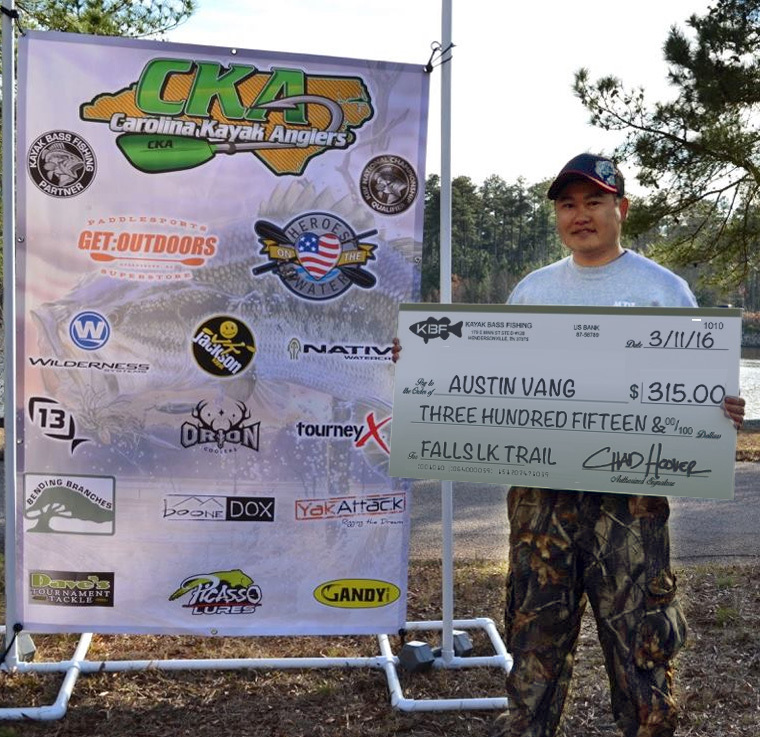 KBF-sanctioned tournaments and events increase awareness of kayak bass fishing in general and the Partner, specifically, on a local and regional level. They reinforce the Partner’s brand and increase the number of active club or tour participants. These events also recruit new KBF Members, support KBF sponsors, and enable KBF to fulfill its mission to grow the sport of kayak fishing, build community, provide rewarding competitive opportunities, and drive innovation. In addition, KBF has in 2018 added another big “Why?” in a new rewards program. Tournament Directors who actively engage with and provide significant assistance to KBF Leadership in securing Sponsorship, Venue/Tourism Grants, or other event or series monetary funding are eligible to receive a percentage of the funding as a Referral Reward. For funding amounts of $1,000 to $4,000, the Tournament Director will receive 10% of the funding amount as a cash payment may elect to receive KBF Sponsors’ Products worth 14% of funding based on retail value. For funding amounts of $4,000 or more, the referral rewards percentage doubles. The Tournament Director will receive 20% of the funding amount as a cash payment may elect to receive KBF Sponsors’ Products worth 28% of funding based on retail value. Tournament Directors may choose to redirect the Referral Award to the Partner club, tour, organization, or business they represent. To help a TD coordinate his efforts with KBF staff members who are working with him to make his KBF TRAIL Series Tournament successful, here’s a typical sequence of event prior, during, and following the TRAIL event. Distribute a W-9 Forms to every prize winner and request that he fill it out completely, including his SSN and signature. 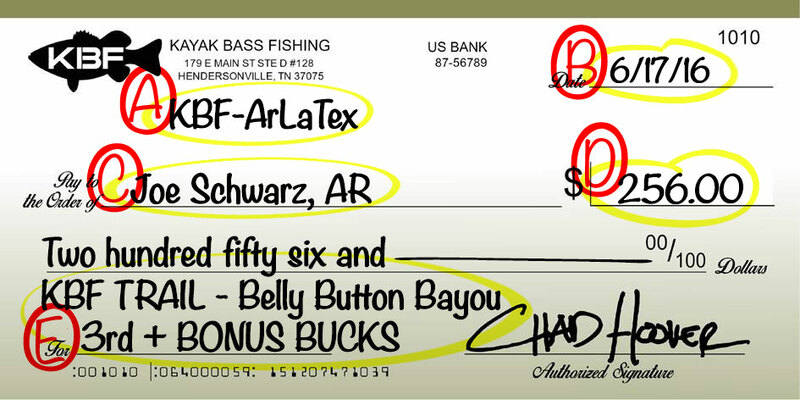 Mail completed W-9 forms to KBF, 170 E Main St Ste D, Hendersonville, TN 37075; or for faster payout, scan and email them to accounting@kayakbassfishing.com. You will receive, by USPS or UPS, a carton with a 3-foot wide presentation check and an email from KBF with a return/forwarding shipping label in PDF format. Unpack the check and save the bubble-wrap packing material and carton for a return or forwarding shipment. It either goes back to KBF or to the next KBF TRAIL Series Tournament Director. Recruit someone with decent equipment and good photography skills to take a photo of each prize winner holding a giant check. Referring to the illustration on this page, print (A.) host organization, (B.) the date, (C.) recipient’s name, (D.) amount of the prize + bonus (if any), and then (E.) event name printed in black dry-erase marker. NOTE: KBF’s presentation checks are mounted on PVC board and laminated with a clear film. Please use only EXPO dry-erase markers, the brand most compatible with the check’s laminate film and leave the least residue on the surface. Wrap the presentation check with bubble-wrap, insert it in the shipping carton you saved earlier, tape it, attach the mailing label that KBF will email to you as a PDF, and take it to a US Post Office or mail drop.